I've recently come across this nifty little social photo sharing tool. "slide" is fun and easy to use. I've created an EVE Online feed (surprised aren't you) and will upload my screenshots over the next few days. Head over to my ticker to enjoy what've uploaded so far. While looking up Technorati for EVE Online blog posts, I came across an interesting post on LiveJournal from Evil Dr Ganymede and his 3D model of an EVE Online spaceship, a Rifter. It's a work in progress, but you've got to give it to him, the guy has a real talent. Head over to this thread on the Lightwave Group forum to read about his experience and to see the progress he's made so far. I've taken the liberty to create a set on my flickr account with all his shots so far. It's been over a week since my last post and there's a good reason for that. Last Tuesday, I flew to Las Vegas for a 5 day vacation and to attend the first ever EVE Gathering. I'd would have never believed Vegas was so much fun, even for someone who does gamble, but it was a blast! 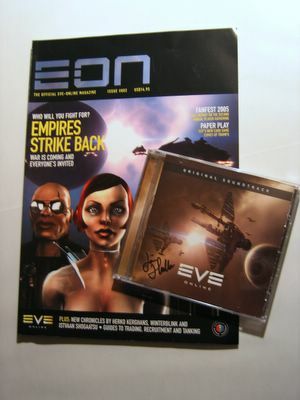 I've always wanted to go to an EVE Fan fest in Iceland, but Vegas being that much closer, I could miss the opportunity. And I'm glad I went. I had a chance to meet some fellow PPL members (Bandus, Isuridae, Dontcha, Dr Seuss) and meet the Devs (Oveur, TomB, LeMonde, Kieron, ActiveAlli). My wife and I even got a chance to eat with Oveur, TomB, LeMonde and the ladies of EVE, having won a dinner with them. Here is the link to the photos of the event for your enjoyment! The third part of the Windows Vista review, Windows Vista Part 3 - Networking and Security, has been available for sometime now. Some of these security features will make for a welcomed improvements of XP. And the various new (updated) protocols that Vista will support will be interesting to have if the improvements they claim to add are actually noticeable to us users and not just to testing softwares. EVE Online: EVE News Prize!! After a few weeks of waiting patiently, I finally got my EVE News prize, consiting of a copy of the 2nd E:ON issue and a copy of the EVE Online Original Soundtrack signed by the composer, Jon Hallur Haraldsson. Pretty cool! Now how do you put stuff on ebay again? Never! So last evening, after patching the game with the 72Mb update, I headed straight to character creation to see the new bloodlines. To be honest I did not have a lot of time to research them properly and explore the new possibilities available with these new bloodlines. I might consider the Power of 2 offer from CCP and create a new character under a new separate account (hey, 6 months at $50 for a new account, can't go wrong). Will just have to see. Here are screenshots of the 4 new bloodlines - one for each of the races. Here above on the far right are the Achura, part of the Caldari dominion. Here, the Vherocior, proud and free Minmatars. Here are the people I currently do missions for, the Khanid, proud members of the Amarr Empire. Last but not least, the Jin-Mei, of the Gallente Federation. I'll explore each bloodline over the week-end and will try to post more early next week. Let me know if you plan to create a new character yourself, and let me know which, why and what you plan to do with new character. The new EVE Online Asian bloodlines are being rolled out today on Tranquility (EVE's live server) as part of a patch. This should be a lot of fun, though I still have to work on my current character, Treenara Mazouk, if I want to increase my faction standing with the RKN and KN. Still, I can't wait to see these new asian based characters, four in all, one for each on EVE Online's major races: the Amarr, the Caldari, the Gallente and the Minmatar. From the few screenshots I've seen so far, and the article in E:ON, this should be interesting! I'll post some screenshots later tonight. 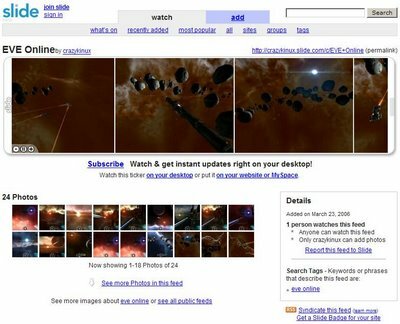 All the EVE Online Guides you ever needed!